Give Thanks with the Thanksgiving Baby Shower Theme! With a thanksgiving baby shower you can invite family and friends to gather together and enjoy a warm and festive celebration of your blessings. At the time of year set aside for us to remember our blessings and give thanks for what we have, it is only fitting to have a baby shower to celebrate our most treasured possessions. What are our most treasured possessions? Mine are my children. What is more fitting than a baby shower to give gratitude for life's most precious gift? Use your computer word processing program to print out homemade invitations. Using card stock cut out 4 baby shower invitations for each sheet of card stock. Glue turkey, or autumn themed scrap booking paper to each invitation. Then print out the following on vellum paper. We're gathering together, no matter the weather, to give thanks for a child sent from above. Join us in celebrating god's great gift of love. It's a baby shower for (mom and dad's names). Date, Time, Place, RSVP Info. Attach the vellum to the card stock using ribbon. The vellum is a classy touch to your invitations and it is see-thru so it will show the festive paper behind it. Thanksgiving Trivia- We celebrate thanksgiving every year, but how much do we really know about it? Here is a fun trivia to use for your friends and guests at your baby shower. Gobble Gobble Yum Yum- Have a pie eating contest for a few select guests at the baby shower. Tie their hands behind them to make it really fun. Turkey Draw- Hand each guest a pencil and a paper plate. Have them place the plate on their head and on the word go they are going to try to draw a turkey on the plate. You can have the mom-to-be judge the contest. The winner gets a prize. 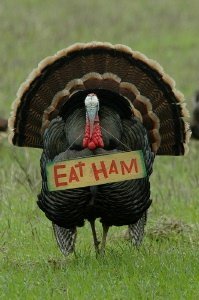 Thanksgiving Word Scramble- Create a list of thanksgiving holiday items. Scramble them up and give it to your guests to try to figure out what the thanksgiving words are. Your harvest and thanksgiving decorations match perfectly with this theme, no need to take them down for the baby shower. During thanksgiving we celebrate in autumn colors of orange, brown, gold and red. Sprinkle some fake colorful leaves on the table. You can use the season's best with squash, pumpkins, acorns, and pine cones. The Halloween season is really close to thanksgiving so you still might have corn stalks, scarecrows and bales of hay decorating the yard. Decorate baby bottles to look like turkeys by using colorful construction paper and double sided sticky paper. Place around the room among your decorations to give it a fun baby look. Traditional thanksgiving meal items work perfectly with this theme. For snacks you can have deviled eggs, cheese and meat trays, and vegetable trays. Miniature pecan tarts and a pumpkin pie or cheesecake cut into individual squares can be really festive to use. If you are looking for a little heavier fare...green bean casserole and mashed potatoes are great fillers. I love eggnog at this time of year but you can also use the traditional baby shower punches or some warm apple cider. If you would like to do finger foods, using a cookie cutter in the shape of a turkey or autumn leaves to liven up your food. Enjoy the harvest with a hot apple cider bar for your guests. Serve mix ins with this classic recipe for everyone to enjoy. The Torani syrups have all kinds of great flavors to use such as the pumpkin spice, cinnamon and caramel. Some excellent other toppings to use is whipped topping, ice cream and caramel sauce. Yum! Mix together and bring to a boil. Simmer at least 30 minutes. Remove spices and serve. Pour cider into mugs, stir in any syrups of choice, top with ice cream, whipped topping and any other mix ins. Enjoy! A Pumpkin Floral Arrangement- Cut the top off a pumpkin and hollow it out. Place floral foam inside the pumpkin. Arrange autumn flowers, leaves and other decorations using the floral foam as a base to hold everything. A twist on the pumpkin floral arrangement would be to use a cornucopia instead. Cornucopia Floral Arrangement- Buy a cornucopia at a craft or decoration store. Use the floral foam to arrange berries, flowers, leaves and anything else that reminds you of thanksgiving inside the cornucopia. Some fun prizes for a thanksgiving themed shower would be nuts, Chex mix, caramel popcorn, and any home decor items with a thanksgiving theme to it. A great way to let your guests know you are "thankful" for them coming is to give them a small token of your affection. Thanks for coming to (mother's name)'s baby shower. We hope you had fun! Love (hostess, mom, dad) and our little turkey!